This is a physical interface which acts as a multipoint interface. All IP to DLCI mappings as well as IP address configuration, should be done under a physical serial interface. Broadcast option at the end of DLCI mapping statement should be added, if we want to send multicast or broadcast packets over this interface. This is required especially, when we are planning to use a dynamic routing protocol over this interface. Now I want to configure labnario2 router. I will use a logical p2p subinterface. As you can see, there is no fr map ip statement under a point-to-point subinterface. We do not need it, because only one PVC can be assigned to this type of subinterface. All packets with a destination IP address from the range of 123.100.1.0/24, will be routed through this PVC. 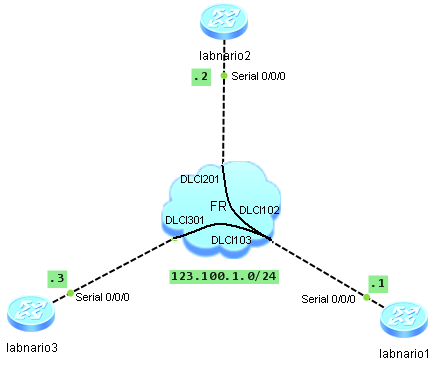 On the labnario3 router I will use a logical p2mp subinterface. Logical point-2-multipoint frame relay interface configuration is similar to physical interface, as both are multipoint. The only difference is that DLCI to IP mappings and IP address should be configured under a logical serial subinterface not under a physical serial interface. How to verify if our frame relay interface is working correctly? First I want to check connectivity between routers. This is a DTE side, frame relay switch acts as a DCE.